...... you. If you prefer the best of both worlds, you can switch easily between the two. Works with WordPress, Blogger, Tumblr, Squarespace, TypePad, Movable Type and dozens more through standard MetaWeblog and AtomPub interfaces. Build a template to match your blog, then let MarsEdit's live preview show you how your posts will look before you publish them. Use Markdown? MarsEdit will preview that, too. Combine the power of MarsEdit with your favorite editor. Integrates cleanly with BBEdit, SubEthaEdit, TextMate, TextWrangler, and any editor that supports that ODBEditor suite. Quickly scan your iPhoto, Aperture, Lightroom, or Flickr libraries, and insert images into your blog post with the click of a button. Upload images and files directly to your blog, or attach them to a post for automatic upload-on-publish. MarsEdit will even resize them to suit your needs. Qweas is providing links to MarsEdit for Mac 3.4.2 as a courtesy, and makes no representations regarding MarsEdit for Mac or any other applications or any information related thereto. Any questions, complaints or claims regarding this application MarsEdit for Mac 3.4.2 must be directed to the appropriate software vendor. 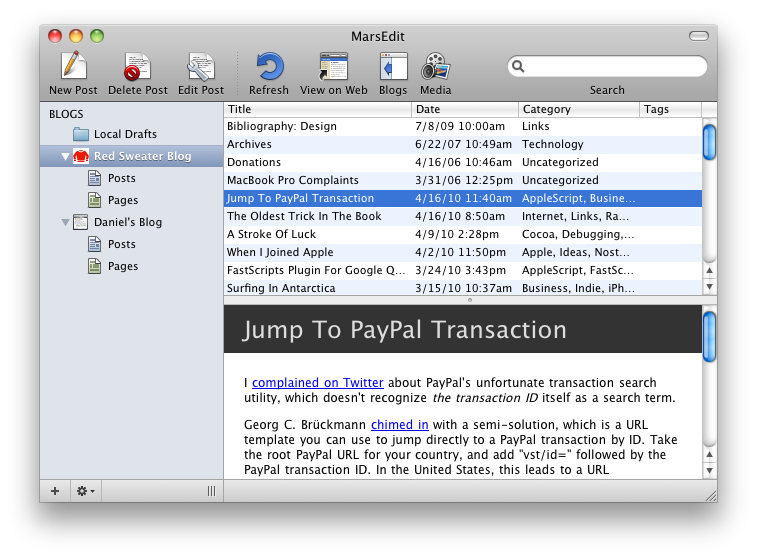 You may click the publisher link of MarsEdit for Mac on the top of this page to get more details about the vendor.